I run across this article from ITBusiness.ca about Web 2.0 in companies. "Employees are increasingly concerned about finding the information they require. So as a result, some of the Web 2.0 types of approaches are quite popular... Workers will start demanding mashup tools that will bring together information from two or more applications. And this is how business computing could change as a result of Web 2.0..."
The best pictures of the year from MSNBC (slide show with audio). 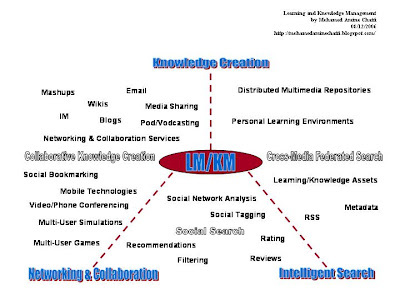 I´d like to share some thoughts about the future of learning management (LM) and knowledge management (KM). I believe that we need a fundamental shift toward a more social, personalized, open, dynamic, emergent, and knowledge-pull model for LM and KM, as opposed to the one-size-fits-all, centralized, static, top-down, and knowledge-push models of traditional LM and KM initiatives. 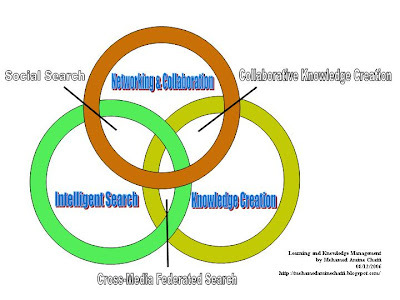 As illustrated in the the figure above, future LM and KM models should revolve around three core components: networking&collaboration, knowledge creation, and intelligent search. Networking&Collaboration: LM and KM approaches need to recognise the social aspect of learning and knowledge and as a consequence place a strong emphasis on knowledge networking and community building to leverage, create, sustain, and share knowledge in a collaborative way, through participation, dialogue, discussion, observation, and imitation. Social software (that I would rather call Networking and Collaboration Services or Social Media) can help building communities and networks. Knowledge creation: LM and KM systems need to provide environments that support collaborative knowledge creation and effective capturing of quality and context-rich knowledge as it gets created. The collective intelligence ensures that knowledge is up-to- date and relevant. This collective intelligence is what is making e.g. Google, EBay, Amazon, YouTube, and Flickr so successful and popular today. Intelligent search: We need cross-media, federated, and social search engines that build on user recommendations, reviews, filtering, and rating to locate quality resources, services, communities, and experts. The search result should be modular content than can be remixed to generate personalized learning resources, lightweight services than can be mashed up to form adapted services, personal learning environments (PLEs) that can be aggregated to build a community, and small communities that can be networked to create interdisciplinary knowledge clusters. The PROLEARN Summer School will bring together PhD students with experienced researchers from PROLEARN or from top international institutions in or across the scope. The summer school will take place in Fréjus, France. At equal distance between Cannes and St. Tropez this city of art and culture has built up a rich historical and architectural patrimony. This has been an active and dynamic city since Julius Caesar himself founded it in 49 B.C. and right up to the present with the French Navy often at shore here. The city is filled with monuments. These include one of the largest amphitheaters from Gallic times (1st or 2nd century), a Roman theater, the Porte Dorée (a golden door, ruins from baths of the 3rd c.), the Porte des Gaules, the aqueduct which carried water from Signole for 40 km and the Cocteau Chapel, designed by Jean Cocteau in 1961 and finished by E. Dermit in 1965. Fréjus is also a seaside resort where the sea once again finds itself in the center of the city with the construction of the Port-Fréjus. It has been built on the site of Fréjus-Plage that was partially destroyed in 1959 after the rupturing of the dam at Malpasset. The little port of St. Aygulf gives easy access to the beach paths where one can discover the wild inlets and the sand beaches of this pleasant hamlet. Building on successful summer schools in 2005 and 2006, PROLEARN, the Network of Excellence in Technology Enhanced Learning for Professionals, is pleased to announce its PROLEARN Summer School 2007. Our ambition is to foster cross-domain training and collaboration opportunities among researchers in Europe and beyond, working in the disparate fields of expertise which promote the advancement of TEL at the workplace. The programme includes lectures and working sessions from leading professors in the field, trans-European tutoring, mentoring, and joint research opportunities, as well as internships with industrial partners. Additionally the school will offer practical sessions in research methodology for Technology Enhanced Learning. Advanced PhD students will be identified to present their research at the EC-TEL 2007 Conference in September in Greece: http://www.ectel07.org. PhD students are asked to share a double room with other PhD students. In order to increase social contacts among the summer school participants, the programme will include several social events. A variety of sport activities will also be offered to the summer school participants. The cost for PhD students is Euro 500 (including accommodation – 6 nights in double room, meals and excursions). The PROLEARN network offers 21 scholarships to PhD students for covering the costs of the summer school. Please indicate if you apply for a scholarship. The summer school is intended for PhD students investigating the Technology Enhanced Learning related issues and making progress on their dissertation research. PhD students are invited to submit applications to summerschool@i5.informatik.rwth-aachen.de. The application should include a Curriculum Vitae and an abstract (not to exceed 5 pages including references and any figures, tables, etc.) describing the student’s dissertation. The deadline for submissions is March 1st, 2007. To ensure a high ratio between tutors and students the school will be limited to 60 participants. We look forward to seeing you at the summer school! The list of Edublog Awards 2006 winners is at http://incsub.org/awards/. EdTechTalk webcast the Edublog Awards Ceremony. In a user-centric knowledge-pull model for learning management, we need intelligent search engines to locate e.g. quality learning resouces. Google Scholar is a good example of a search engine that is capable of ranking the search results based on relevance. Anurag Acharya, principal engineer at Google writes "Google Scholar is a free service that helps users search scholarly literature such as peer-reviewed papers, theses, books, preprints, abstracts and technical reports. Just as with Google Web Search, Google Scholar orders your search results by how relevant they are to your query, so the most useful references should appear at the top of the page. This relevance ranking takes into account the full text of each article as well as the article's author, the publication in which the article appeared and how often it has been cited in scholarly literature. Google Scholar also automatically analyzes and extracts citations and presents them as separate results, even if the documents they refer to aren't online. This means your search results may include citations of older works and seminal articles that appear only in books or other offline publications". Just came across this post by Angus Kelsall, Head of Google Dublin office while browsing through my favourite Official Google Blog. 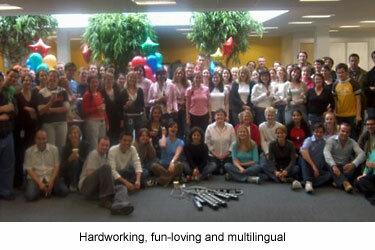 I do like the group photo so much; a group of young Googlers from 35 countries who speak 17 languages. Sounds really great! I´d love to join this group after my PhD if possible! Some time ago, Stephen has also written a nice paper entitled "Learning Networks and Connective Knowledge". Here are the MS-Word version, MP3 Audio and PowerPoint Slides related to the same. Abstract: "The purpose of this paper is to outline some of the thinking behind new e-learning technology, including e-portfolios and personal learning environments. Part of this thinking is centered around the theory of connectivism, which asserts that knowledge - and therefore the learning of knowledge - is distributive, that is, not located in any given place (and therefore not 'transferred' or 'transacted' per se) but rather consists of the network of connections formed from experience and interactions with a knowing community. And another part of this thinking is centered around the new, and the newly empowered, learner, the member of the net generation, who is thinking and interacting in new ways. These trends combine to form what is sometimes called 'e-learning 2.0' - an approach to learning that is based on conversation and interaction, on sharing, creation and participation, on learning not as a separate activity, but rather, as embedded in meaningful activities such as games or workflows." Here are PowerPoint Slides and MP3 Audio of a presentation Stephen Downes gave last week in an online conference via Centra about Web 2.0, E-Learning 2.0 and Personal Learning Environments. Then for the tease: “And, you know, [inside the browser and outside the browser are] moving towards each other, but there’s still a bit of a barrier there, and new technology, things we’re working on, really will change that.”"
The notion of informal learning is becoming increasingly important. In a corporate context, learning is much more than formal training. And, our academic learning also comes from different informal channels; e.g. through games, simulations, experiments, story-telling, discovery. Outside the classroom boundaries, we use Google, communicate with peers, join online communities, work on problems together, share learning resources etc. Actually I don´t like the distinction made between formal and informal learning. It´s all about learning. Whether it comes through formal or informal means, it doesn´t matter. I believe we should blend formal, informal learning, and knowledge management into one integrated solution that places the learner/knowledge worker at the center and gives him/her the control over the learning experience. The primary goal is to enhance the personal and professional performance and increase the ability of any individual, project team, or organisation to cope with the demands of the new knowledge intensiv era. 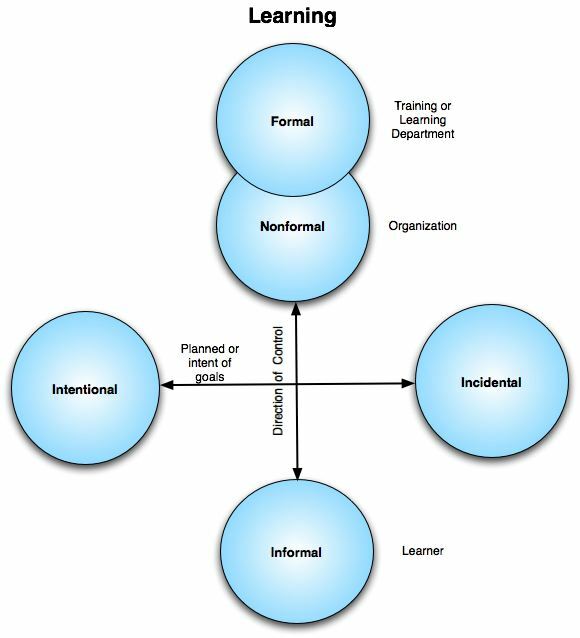 In this post, I´m trying to compile a list of definitions of informal learning. The list is far from being complete and will be updated regularly. Please let me know if you find or have your own definition of the same. Jay Cross writes "At work we learn more in the break room than in the classroom. We discover how to do our jobs through informal learning -- observing others, asking the person in the next cubicle, calling the help desk, trial-and-error, and simply working with people in the know. Formal learning - classes and workshops and online events - is the source of only 10% to 20% of what we learn at work". Marcia Connor states "Informal learning accounts for over 75% of the learning taking place in organizations today. Often, the most valuable learning takes place serendipitously, by random chance". Juliette White notes "The degree of informality of learning is the degree to which you haven’t been told what to do i.e. informal learning by definition can only be influenced by creating an environment and not by direct instruction". Process. This includes learner activity, pedagogical styles and issues of assessment: that is, the learning practices, and the relationships between learner and others (tutors, teachers, trainers, mentors, guides). Location and setting. Is the location of the learning within a setting that is primarily education, community or workplace? Does the learning take place in the context of: fixed or open time frames; is there specified curriculum, objectives, certification; etc. Purposes. Is the learning secondary to other prime purposes, or the main purpose of itself? Whose purposes are dominant – the learner’s, or others’? Content. This covers issues about the nature of what is being learned. Is this the acquisition of established expert knowledge/understanding/practices, or the development of something new? Is the focus on propositional knowledge or situated practice? Is the focus on high status knowledge or not?". Stephen Downes writes "What makes informal learning different from formal learning is not that it is formless, but rather, it that it is conducted outside the domain of the formal education infrastructure, with the associated and not trivial implication that it is managed by the learner, and not the professor or institution". "The learning zone is the convergence of formal and informal learning within a social context where the interests of the enterprise and individual meet. The role of social networks is essential to successful learning in enterprises. We know that 70 to 90 percent of learning is informal, a combination of personal reflection and social exchange with trusted. Extracurricular IS the curriculum. Why leave the potential benefits of informal learning to chance? Companies are becoming more strategic in their approach to learning as they shift focus to informal, experiential aspects of employee development". Donald Clark states "rather than learning being organized around an event, it becomes a network of both planned and spontaneous situations. Some business processes are just too important to be left to chance. For example, manufacturing a product to specifications or safety procedures normally require that some type of formalized learning be given. Yet, it does not require strictly formalized learning methods. Competencies require the mastery of the 5 Cs: Content, Conversation, Connectivity, Collaboration, and Context. And finally, it is the experiences provided by the other four Cs that give the learners a more well rounded picture or context -- information only becomes relevant when it is related to something the learner is already familiar with." On the Official Google blog and Google Web Toolkit blog, the GWT team announced GWT 1.3 Release Candidate. The only thing that has changed since GWT 1.2 is the the release of all the source code for GWT under the Apache 2.0 license. Simon Dückert, vice president of "Gesellschaft für Wissensmanagement e.V. (GfWM)" has compiled a list of top 20 knowledge management links. Well worth a look! David pointed me to the new Amazon´s charging service Mechanical Turk. The main idea is that people pay people to complete specific tasks. According to Amazon, "Amazon Mechanical Turk provides a web services API for computers to integrate "artificial artificial intelligence" directly into their processing by making requests of humans. Developers use the Amazon Mechanical Turk web service to submit tasks to the Amazon Mechanical Turk web site, approve completed tasks, and incorporate the answers into their software applications. To the application, the transaction looks very much like any remote procedure call: the application sends the request, and the service returns the results. Behind the scenes, a network of humans fuels this artificial artificial intelligence by coming to the web site, searching for and completing tasks, and receiving payment for their work". The workshop is designed to serve as a forum for all research areas related to Social Software and its use in Technology Enhanced Learning. The meeting, which is the 4th thematic workshop of PROLEARN and organized together with the project iCamp, will provide unique networking possibilities for participating researchers and users in this field. It will enable discussions around innovative research results and findings, experience reports and further research needs, as well as case studies describing innovative applications of new Social Software learning environments and approaches. We welcome all interested researchers, practicionnairs and intermediaries focusing on the aspect of Social Software for Technology Enhanced Learning to participate in the mornings plenary and to contribute actively in the second part of the workshop. More informations are available at http://tws.prolearn-project.org/. The Dojo Team has released Dojo 0.4.1 with new features and over 180 total bugfixes & improvements. Lilia Efimova has conducted a study on blogs at Microsoft and published the results of the same in her paper Crossing boundaries: A case study of employee blogging together with Jonathan Grudin from Microsoft Research. The goal of this study was to "explore where, how, and why employees blog; how personal the writing is in work-related weblogs; what happens when blogging becomes a formal work objective; perceptions of the personal and business impacts of blogging; and possible steps to make blogging more effective". Well worth a look! With the advance of metadata standards, learning objects, Web 2.0 approaches to rip, mix & burn, wikis, blogs, syndication, user generated content, interactive TV, games and the ubiquitous availability of computing devices we can and have to offer more flexible learning services on a global scale. As one of the new objectives of the 7th Framework Program of the European Commission puts it: we need “Responsive environments for technology-enhanced learning that motivate, engage and inspire learners, and which are embedded in the business processes and human resources management systems of organizations”. An important challenge is to bridge between informal learning strategies of the knowledge society and formal competence development programmes of organizations. After the success of EC-TEL06, the Second European Conference on Technology Enhanced Learning provides a unique forum for all research related to technology-enhanced learning, including its interactions with knowledge management, business processes and work environments. This is a competitive and broad forum for technology enhanced learning research in Europe and world-wide through specialized workshops and the main conference. EC-TEL 2007 provides unique networking possibilities for participating researchers throughout the week and includes project meetings and discussions for ongoing and new research activities supported by the European Commission. We welcome submissions describing innovative research on all relevant issues in computer science, learning, and the organizational context, as well as experience reports and case studies describing innovative applications of new learning environments and approaches. All submissions will be reviewed for relevance, originality, significance, soundness and clarity by three reviewers. Proceedings will be published in Springer LNCS (http://www.springer.de/comp/lncs/index.html). For camera-ready format instructions, please see “For Authors” instructions at http://www.springer.de/comp/lncs/authors.html. The page limit is 15 pages for full papers, 6 pages for posters. Selected papers will be considered for special issues of relevant journals. Workshop descriptions will be published in the conference proceedings. Just came across the Yahoo! TV service, while browsing through the Ajaxian blog. Yahoo! TV seems to be based on the AJAX framework YUI. Dion Almaer writes "Yahoo! TV has had a face lift and it has a lot of the usual suspects from YUI: Nice smooth tabs, a carousel for picks, and a mini tv listings on the right side, the full tv listings show up on demand as you scroll down".